Chase has been featured in Beverly Hills Magazine's Rising Star Spotlight. Read it here. "With charming good looks, a natural confidence, and an irresistible personality we’re sure he’s well on his way to becoming the next Ryan Gosling." Chase's starring role in his feature film ON THE ROCKS has been reviewed in the LA TIMES (printed), LA TIMES (online), LA Weekly, & Forces of Geek. "...serve(s) as a terrific showcase for the comedic talents of its ensemble, especially... the Ray Romano-esque Fein." "On the Rocks is like a blood pressure–raising anxiety attack extended to an hour and a half — except funny." 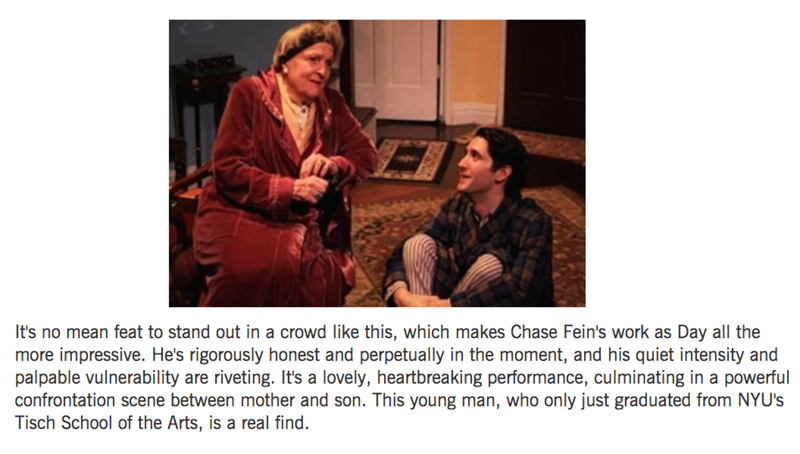 A review from Backstage _ Fresh out of drama school in his first Off-Broadway play Songs & Statues. Read it here. "It's no mean feat to stand out in a crowd like this, which makes Chase Fein's work as Day all the more impressive. He's rigorously honest and perpetually in the moment, and his quiet intensity and palpable vulnerability are riveting. It's a lovely, heartbreaking performance, culminating in a powerful confrontation scene between mother and son. This young man, who only just graduated from NYU's Tisch School of the Arts, is a real find."